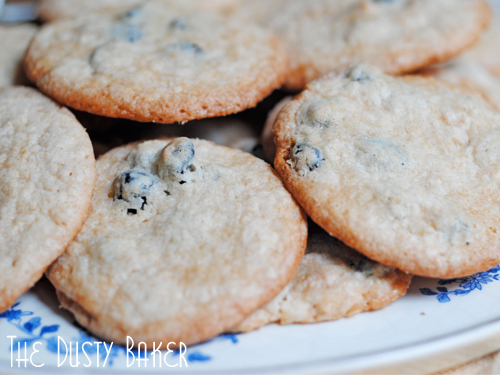 Gluten-Free Blueberry and Cream Cookies – Milk Bar Mondays! One of the many things I love about our Milk Bar Mondays swap is that it helps me branch out with the kinds of baked goods I make. This cookie is a perfect example – I wasn’t totally wowed by them, but I gave a bunch away for my New Years presents (I’ve decided that I’m giving cookies away in January instead of for Christmas, and it’s my new favorite tradition), and tossed some at my roommate. These still aren’t my favorite Milk Bar cookies… I still stick to my Compost and Confetti cookies loves. But they are incredibly sweet and chewy, with a crunchy edge. Delectably buttery. And when you make them in my size (versus the behemoths that the original batch makes), you get dozens of treats for sharing. I know my recipe is missing something because my crunch didn’t work out – how do you make Milk Crumb without milk?!?! I’d experimented with powdered non-dairy coffee creamer and the result was a tasty sort of brittle – not a crumb. But the cookies are still darned good without it. So much so that my roommate proclaimed them victorious over the little peanut butter kiss cookies she’s requested for years now. 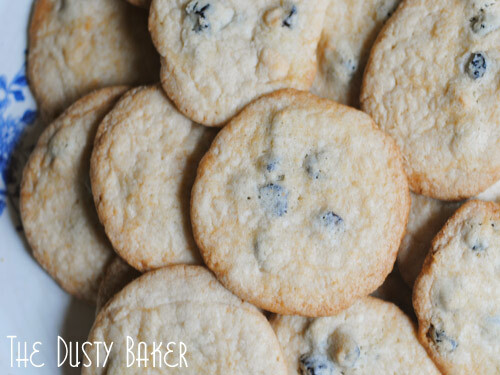 For the original recipe, head on over to Cassie at Bake Your Day! and follow us on all Twitter and Pinterest! Combine butter, sugars and glucose / corn syrup in a bowl of a standing mixer with the paddle attachment and beat on medium-high for 2-3 minutes. Add the eggs, scrape down the sides of the bowl and paddle on high for 7-8 minutes, until the mixture is extremely fluffy like gorgeous frosting. Reduce the mixer to low and add all the dry ingredients until just incorporated. With a tablespoon, scoop onto parchment or Silpat lined pans about 1 inch apart. Wrap in plastic wrap an refrigerate for 1 hour or up to 1 day. When ready to bake, heat oven to 350°. Place cookies on lined sheets 3 inches apart and pat domes a bit flat. 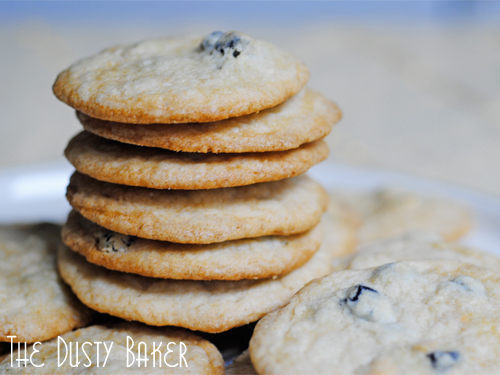 Bake for 18 minutes or until cookies had spread and browned at edges. Cool on mats until firm, then move to cooling racks to cool completely. *My cookie flour ratio is about 3 parts flour (millet, brown rice, white rice etc.) to 2 parts starch. So for this if you’re blending your own estimate around 1 1/4 cup flour and 3/4 cup starch. Check out my gluten-free flour page for more info.